Roger Federer opened his quest for a record seventh title at the ATP Finals on Sunday by beating season finale debutant Jack Sock at The O2 Arena in London. Second seed Federer recorded his 50th match win of the year with a 6-4, 7-6 (4) victory over eighth seed Sock in one hour and 31 minutes in their Group Boris Becker opener. 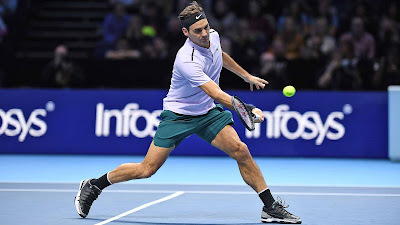 Federer capitalised on early nerves by Sock, winner of his first ATP World Tour Masters 1000 title at the Paris Masters seven days ago, with a service break in the first game. Sock grew in confidence by using his powerful forehand to pierce holes in Federer’s game, but he was unable to break back. "I'm happy that I was able to come out today and had actually good energy," Federer said. "This is the best I've felt since the final in Basel. I'm very happy to see that I didn't have to pay the price for taking it easy and resting and recovering. But then turning it up the last few days got me in shape for today. Now I think I'm in the tournament. There's no more turning back. Just full steam ahead every match that comes." At 3-3, 30/40 in the second set, Sock struck a serve that jammed up Federer on a backhand return in a confidence-boosting hold. In the American’s next service game, he recovered from 15/40 — and saved five break points in total. "I think we're all going to start playing better every round that goes by," Federer added. "It's just still early days in the tournament. Can't expect to play your best against the best players in the world in that first match. "It was more about managing the match rather than actually having a certain way how you play and what you were really thinking about. Sure, I had a tactical plan with my team. But very often in a first match like this, it gets thrown overboard because at the end you're just happy to be serving well. Focus on that first, and then on the return game sort of try your best, try to keep the ball in play and go from there." Federer, in contrast, lost just two of his first-service points through his first six service games of the second set. In the tie-break, as Federer edged closer to his 12th victory over a Top 10 players in the ATP Rankings, he opened up a 4/2 advantage. The encounter ended with Sock striking a backhand return long. Federer is now 53-12 at the ATP Finals, which he first qualified for in 2002 when the tournament was played in Shanghai. Federer improved to a 4-0 ATP Head to Head record against Sock, which also includes a win at the BNP Paribas Open in March. The Swiss has a 50-4 match record in 2017, including an ATP World Tour best seven titles.